Fruit toppings: Kiwi, shredded coconut, mango, oranges, etc. 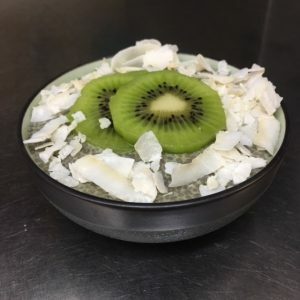 In a medium bowl combine the u-matcha and chia seeds. Gently whisk in the coconut and almond milk. Continue to stir until the mixture start to thicken. Stir in sweetener and vanilla. Refrigerate for 6 hours to overnight. Enjoy with your favorite fruit toppings.